December is on and I've been the mother of two for more than two weeks now! We are enjoying being a family of four and all that follows with a newborn and a toddler. ..equals not much sleep and a lot of diaper changes! So we have not planned and prepared for Christmas yet, but we are high on being plus one in the family and it's been just as special this second time! 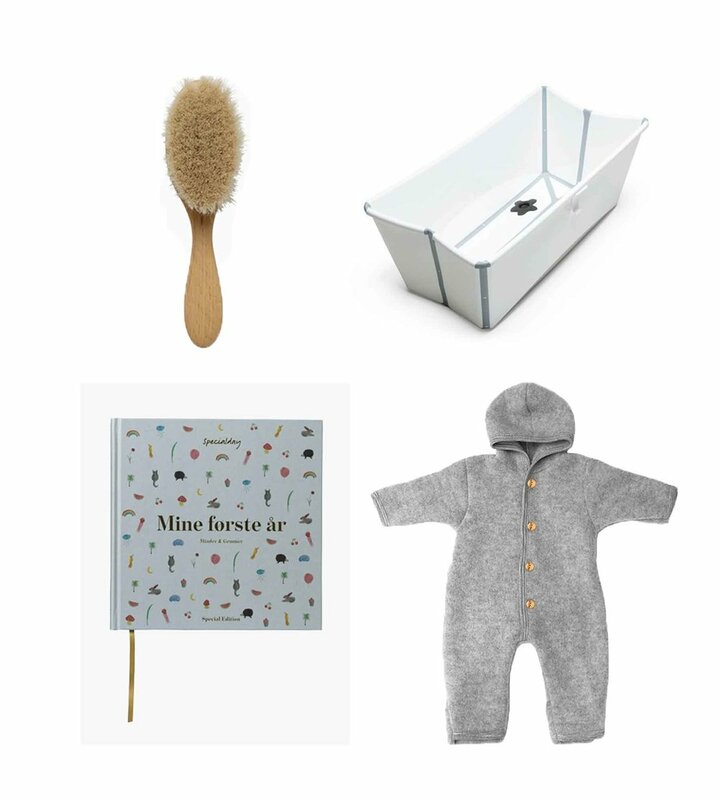 I've been looking at newborn essentials and products that we once again enjoy to use. Like Walter, baby brother is a winter newborn. And to keep a winter newborn warm I find cashmere and merino wool essential in all clothing. The function of cross bodies or blouses are preferred. And I like natural and boyish colours. Newborns need a lot of nursing. Both Walter and baby brother had a lot of hair from newborn and it was important for me to care about it as much as possible. I used a soft brush for their hair before and after bath. I was given this book from Specialday at my first baby shower and what joy it has given me since. Well, it's a lot of work, but fun and definitely worth having a book with memories etc. for Walter and why I also got one for baby brother and I can't wait to start. I love the thought of documenting and writing down so that the two of them one day can read about themselves and the first years of their lifes. At our home we do not have a bath, but it doesn't mind when having this foldable bath from Stokke. It's been brilliant for Walter and baby brother already tried it too. And what I love is that Walter is two-years-old and still fits it. This wool/fleece suit has been great for Walter as baby and baby brother has one too from newborn. I like the details with the foldable hands and feet to avoid gloves and shoes. And the suit works great for us both in the car and the stroller. Warm recommended. A wool rabbit music box that plays a sweet melody to keep baby calm. I like to sing for my boys, but at some point you might need some additional help and I find the music box essential and perfect for that. There is nothing like a soft woollen blanket to keep comfortable and warm. I always add a blanket over a duvet during winter time or use the blanket as a swaddle at home. The baby nest is ideal for the crib and on the bed or for safety on the floor and the couch. We do have a lot of soft toys at our home and Walter enjoys all of them - he sleeps and plays with them. And I hope baby brother will do too. With Walter I didn't use a baby carrier that much other than when we travelled. However, I think this second time on maternity leave I would need the function of the baby carrier a lot more now handling a newborn and a toddler at the same time. And also especially when being on my own! So we got both a wrap and a baby carrier to support me. And I think this will work just great! A highchair is essential when the baby sits from approx. 6 months. However, an infant seat can be added and we have enjoyed that Walter could join the table earlier. And so will baby brother. Such a good function added to this chair! A product that works so good with our stroller is a carrycot. It makes it possible for me to leave the stroller and bring on baby easily and without disturbing his rest. This carrycot fits perfect to the Bugaboo Buffalo. And just fits into the Donkey lift part. Previous with Walter we had the Bugaboo Buffalo, but with a newborn and a toddler now we decided to upgrade for the Bugaboo Donkey 2 Duo. This stroller is a convertible pushchair which adapts to our requirements at any given moment of the day, so I can go out with baby brother and/or add a seat for Walter whenever I want to. We have been testing the Donkey 2 for a few weeks and it's been superb for us when strolling with two and living in Copenhagen city! All these selected products and brands are recommended based on our own experience. Brands are individual of choice, but the function of the products I find essential for newborns.